EIBTM exhibition director Graeme Barnett said UK strikes affecting Heathrow airport have had minimal impact on attendance, with the show expected to attract nearly 4,000 hosted buyers, its highest-ever number. He told C&IT that although he did not know the exact numbers, "very few buyers - at the moment, a dozen of so" had pulled out of attending the event. Many buyers were either planning to leave earlier than planned - late on Tuesday evening - to avoid the strike action by immigration staff, or to extend their stays in Barcelona. During an EIBTM press conference, Barnett said that 4,156 hosted buyers were accepted on to the programme with around 3,900 expected to turn up to exhibit on the floor after no-shows and cancellations (250 more than EIBTM 2010). The figures are likely to change post-ABC audit. But DMC representation firm GT Associates, which has a hosted buyer group over from the UK that was due to fly back Wednesday night, had five buyers pull out at the last minute due to concern over the strikes. Director Gill Talbot said: "The problem is, if we could have got them back first thing Thursday, they would still have come, but all we were offered was that they leave today, which would mean they only have a few hours at the show, or leave Thursday night, but many of them need to be back for important meetings or events on Thursday so that wasn't an option." She added: "I'm really disappointed. We put months and months of hard work into this hosted buyer programme and don´t feel we´ve had much support from EIBTM." EIBTM responded to GT Associates' comments, saying: "Regarding GT Associates, they were given the same options as 30 other group coordinaters in the UK, that included help and assistance from the RTE hosted buyer team for the past few weeks, hotlines to call and personal conversations with the hosted buyer teams. "However, British Airways has put all seats on its early flights on Thursday on 'close' so that they can use them for their own passengers who may be stuck on Wednesday night. No-one can book on any of their flights, not even EIBTM." 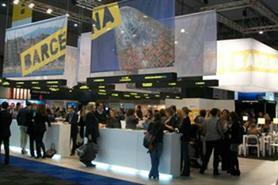 Around 65,000 pre-show appointments at EIBTM have been booked, an increase of 16% year on year. 7,348 trade visitors pre-registered at close of play yesterday, 11% up on 2010.